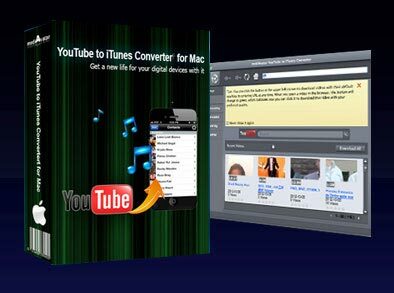 mediAvatar YouTube to iTunes Converter for Mac is a smart Mac YouTube movie converter to iTunes to solve the problem of too many steps from YouTube to iTunes for iPad, iPhone and iPod users. With mediAvatar YouTube to iTunes Converter, all downloading and converting YouTube videos to iTunes will be finished in few clicks on Mac, and then syncing them to Apple devices simply is available. Download movies and audios from YouTube to local disk, and convert any movies from YouTube to iTunes in H.264, MPEG-4 or MP3 formats in 1 step. Convert FLV and MP4 videos from local disk. You can easily download and convert top to 10 YouTube videos in batches at one time with mediAvatar YouTube to iTunes Converter for Mac. Support all iPad, iPod and iPhone formats, and the latest iTunes 10.7. Download and convert YouTube movies at top speed with multithreading and batch conversion tech. You can download and convert movies from YouTube from IE's right-click menu or the built-in browser directly. You can download the YouTube movies via proxy server by setting up the proxy data. You can choose to show the tasks in thumbnail or in list to get the detail info. Download speed, priority level and max simultaneous tasks could be set at will. Choose several post task actions and system power management options freely.